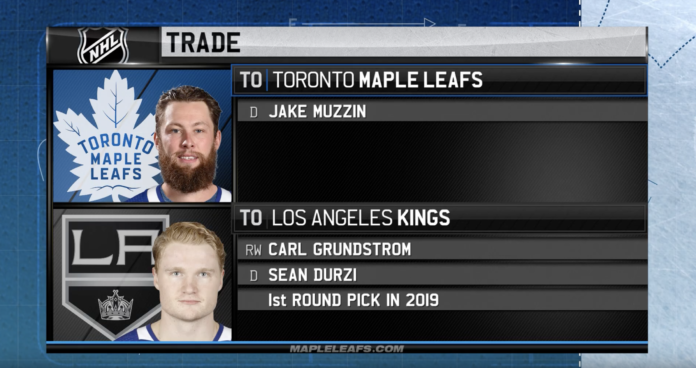 Toronto Maple Leafs General Manager Kyle Dubas and new Leafs defenseman Jake Muzzin addressed the media via conference call after the trade was announced on Monday evening. What is it about Jake’s game that you like and made you want to make this trade? Is Jake going to be playing on the right side or not? Have you talked things over with Mike Babcock? Dubas: I think the key thing for us in acquiring a player like Jake is that he has obviously been a very good defenseman in the NHL for a long time and been a part of… When he joined Los Angeles coming out of junior, they were sort of at the same stage we are now, so he has that experience of seeing a team mature from being the team that wanted to contend to contending and then ultimately winning. He was a big part of their championship team in 2014. He has that experience, but I think beyond all of that, the key is his ability to play at the top end of our defense and play in all situations and play against the other team’s top players. He has proven himself over a good career now to be able to move the puck and to excel at playing against high-quality competition and being able to contribute offensively and defensively. I just thought it was a great fit for us. Knowing his character and what he is about, I just thought it would be a great fit for our locker room as well. We are very excited. As for the question on what side of the ice he is going to play, we are obviously going to have a player or two that are going to have to play their off-side. I’ve talked it over with Mike and I think that is more of a question and a discussion that we will have with all of our players once we all get back from the break. Mike and his coaching staff will [have a discussion] with Jake Muzzin, Jake Gardiner, and the rest of our — not to just list those two — defense to find what might be the best fit to have everybody play to their best potential. Does this have anything to do with Jake Gardiner’s injury, or are you expecting that to blow over a little bit? Dubas: No, no. Jake has back spasms and we fully expect he is going to be 100% here coming off of the break. We don’t have a lot of practice time. But it has nothing to do with the injury. It’s something we have been trying to do for a while now, which is to bolster our defense and improve our club. Was there a sense of urgency to get this deal done now four weeks from the trade deadline? Considering the quality of the player the Leafs are acquiring, was there a sense of urgency to get it done now? Dubas: Certainly, when we are talking about trades of this nature, I think the longer you can have the player for, the better. Especially coming back from the break, it makes it a little bit easier than if we were just immersed into a full schedule. It gives Jake a couple of days with his family to get a little bit organized. This is a life-changing thing, of course. I think it is just more serendipitous than anything that it happened this early with us on the break, but any time you can allow a player to adapt and give them a little bit more time to adapt versus right at the deadline when you’ve only got six weeks left… To have two-plus months here for Jake to settle in and help our team, I think, was important for us and it was important for us to try to help Jake assimilate into our program. How much more attractive was acquiring Jake knowing that he’s got a year left on his deal at a reasonable number? With that being the case, might this affect any further plans going forward in terms of who might be retained, getting at Jake Gardiner on the blue line? Dubas: I think it’s been stated a number of times that our preference was to acquire players that did have some term on their deals. I think this is something — when I say this I am speaking of contending — we are aiming to do year in and year out here as best as we possibly can for as long as we possibly can. Our preference was always to add players that are going to be here for more than just a few months. That was certainly one of the things that was appealing about Jake. He is still in his prime and we are happy to know that he is going to be here for at least the next year and a half and two runs in the Spring. That was certainly appealing. As it pertains to the future for anybody for our roster, this was just to find a player who can bolster our lineup now and we will see how it all plays out with the rest. I don’t think it affects Jake anymore than any of the other things we are working on. When I say Jake, I mean Jake Gardiner. You talked about how the deal is serendipitous. Could you take us through the timeline of when you sort of began kicking tires on this and how it all came together? Dubas: I may have misrepresented there. When I said serendipitous, I just meant in terms of having the break and not having a game tomorrow and trying to rush to get Muzz in to Toronto. It wasn’t necessarily planned out to be now. In terms of the amount of time, I think Rob Blake and I had some conversations going back to around Christmas and then those certainly picked up again prior to them going on their break a couple of weeks ago. We were clearly very interested in Jake and they had a number of players in our prospect pool that they deemed to have high interest in, so we just worked together over the last number of weeks on that and it just kind of culminated today in the deal. It was a good process. Rob was great to work with, and his staff were great to work with. They were very honest and transparent in what they were looking for and I hope they feel that we represented ourselves in the same way. You made a comment about liking the D a lot more than outsiders, media, fans, etc before this trade. Now we can assume you are even more comfortable. Would you agree that this group is in a comfortable spot for you? Dubas: I do like our D. I think we’ve talked at different points to try to continue to bolster it. I think certain players have made outstanding strides this year. Most notably, Morgan Rielly has been outstanding from start to finish and has thrust himself into the upper-echelon of the league. We’ve got a very good group there. To add Jake into that group, we’ve got some very solid veterans as a part of it and some nice up-and-coming players as well. To add him and bolster that group is certainly something we are happy about. What is your reaction to becoming a Maple Leaf, and what are your initial reactions to joining a club that is near the top of the Eastern Conference? Muzzin: I was a little shocked to get the phone call. You hear rumblings and rumours and stuff like that, but you just continue on with your ways until it actually happens and everything sinks in. I’m very excited to join Toronto. I was just thinking about playing them and how we got beat. I was like, “Damn, now I will be a part of that team.” I am really excited for the opportunity. Could you address the fact that you’ve played both sides over the years? What kind of experience has that given you? Secondly, just being part of the Team Canada World Cup experience in Toronto in 2016, how much do you think that helps you get a glimpse of what the spotlight will be like here being a Toronto Maple Leaf? Muzzin: I’ve played a little bit of the right and more so in my career on the left, but I’d be fine either way, I think. There are good enough D back there that we can figure something out. Being in Toronto for that tournament was exciting. I definitely got a glimpse of what everything is about in Toronto in the media and the city and everything like that. I am excited to come and put on the Leafs jersey and play. We’ll let everything else worry about itself. Could you reflect back on cheering for the Leafs growing up and how much they were role models to you as a young man growing up? Muzzin: Obviously, growing up in Ontario, everyone was a Leafs fan and I was included. Playing hockey at a young age, we looked up to Doug Gilmour, Wendel Clark, Felix Potvin in net. It is kind of funny how life works. Here we are. I am coming back home to play for the team I rooted for growing up, so it is kind of ironic. You played 43 playoff games in your first two seasons. You’ve only been able to play seven in the last four years, but you are one of only a few Cup champions on the team now. Two parts: 1) How much is it in your blood to get back and play playoff games and series regularly, and 2) That Cup experience, along with Ron Hainsey, how important is that? There are a lot of guys itching to play a lot more playoff games who just haven’t got the opportunity. How important is that — to bring more experience? You guys traded for Marian Gaborik the year you won — that it is a great example of a ‘been there, done that’ guy. You are now that guy in the Toronto room. Muzzin: Going back to the first question, that is why we play — to get into the playoffs and have a chance at winning the Stanley Cup. I was fortunate enough earlier in my career to have that opportunity and be brought in on a good team and kind of thrown into the fire a little bit early in my career. In the last few years, it has been a battle and a struggle, but I am definitely excited to have another chance at getting another opportunity to get there and have another crack at it, for sure.